Helps Keep Families Closer: Many older adults wish they heard more often from their loved ones. Facebook is a great way to keep up with family and friends on a more frequent basis. It also helps to deepen relationships by allowing seniors to engage in more frequent conversations with friends and family. Skype is a great tool for older adults, allowing online video conversations with loved ones near or far. Improved Feelings of Wellbeing: Older adults whose lives are fairly isolated and are at a distance from loved ones often experience depression. A study by Dr. Shelia Cotten, a sociologist and associate professor from the University of Alabama, Birmingham, revealed that Internet use was associated with a 30 percent decrease in depressive symptoms among older adults who used it regularly, while other studies have shown similarly impressive results. Social Photo and Video Sharing: Enjoying shared memories is now easier than ever through social media. Pictures can be shared via Facebook, Twitter, Flickr, and other social media sites. Grandparents can enjoy photos of the grandchildren moments after they are taken, allowing them to feel more a part of activities they may not be able to attend. Community Belonging: Socializing as part of a community can be critical for homebound older adults. Social media provides the opportunity to have and be a friend, to congregate without leaving the house, and to never have to feel alone. 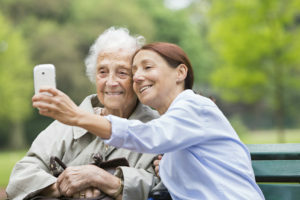 Although social media is a great tool to help your senior loved ones stay socially connected, there’s still nothing to replace face-to-face interactions and relationships. Hired Hands Homecare’s California senior care helps fill in the social gaps for seniors by providing warm companionship along with a full range of home care services, individualized to meet each person’s unique needs. Complete our simple online contact form to let us know how we can help you.